Our House | Out to Eat | Kids VT - small people, big ideas! The "twisted comfort food" at Our House in Winooski may appeal to picky kids — think lobster mac and cheese and a fried peanut butter and jelly sandwich for dessert. But the narrow dining room is often packed with adults sipping cocktails and carrying on intimate conversations. You might not feel comfortable dining with your squirmy toddler. Not during the dinner rush, anyway. Instead, if you want to introduce kids to creative cuisine served in a stylish setting, try Our House for Sunday brunch. Our family of four arrived just after the restaurant opened at 9 a.m. on a recent Sunday. We had the place almost entirely to ourselves; we watched a stream of people walking past on their way to Sneakers Bistro, where the wait for a table was 45 minutes or more. We had our food before they even got to sit down. There's no kids' brunch menu at Our House, so we all ordered adult entrées. Ivy, 2, had a fruit and yogurt plate. Graham, 5, ordered scrambled eggs, sausage and toast. My partner, Ann-Elise, had an omelette with spinach, sausage and cheddar. I wavered between the French toast stuffed with raspberry and chocolate, and the "twisted" eggs Benedict — poached eggs with bacon, deep-fried, and served on a bed of baby greens topped with Hollandaise sauce. I settled on the breakfast flatbread with bacon instead. If I hadn't been taking notes, I would have ordered a mimosa instead of coffee; a specials chalkboard offered the Champagne cocktail with orange, cranberry, grapefruit, pomegranate or pineapple juice or cider. The waitress didn't bring crayons to our table or help us distract the kids. But that was OK. The relaxed but elegant atmosphere turned out to be the perfect setting for a lesson in "restaurant manners." As we waited for our food, we discussed how, when adults go out, they like to talk to each other — quietly. We explained all of the condiments on the table. We pointed out the photos on the walls and used them to start conversations about our own family photos. We ordered one orange juice for the kids to split, and the waitress brought each of them a plastic cup with a lid and a straw. The cups were decorated with robots, which sparked a conversation about funny robot names. The kids were surprisingly well behaved. One of them called me a "booger face," and the other one announced a trip to the potty a little more loudly than I would have liked, but I didn't feel too anxious about it, since we weren't interrupting anyone's romantic dinner. The food was good, too. Ivy's huge bowl of creamy yogurt came surrounded by a colorful array of melons, mango, kiwi and star fruit. This was her first encounter with star fruit. Her face lit up when she tried a bite. "It's delicious!" she said. Graham's eggs were scrambled to his liking. He ended up polishing off his food and half of my flatbread, too. Ann-Elise liked her omelette but wished she'd been able to order more savory fillings, such as olives and capers. That's a minor quibble. All of us enjoyed our bountiful Sunday brunch. The prices and selections were comparable to those at Sneakers and Penny Cluse Café in Burlington, but we were in and out of Our House in an hour. We still had time to take a leisurely stroll along the Winooski Riverwalk before heading home. Cathy Resmer is the Editor of Kids VT. She lives with her partner and their two children in Winooski. 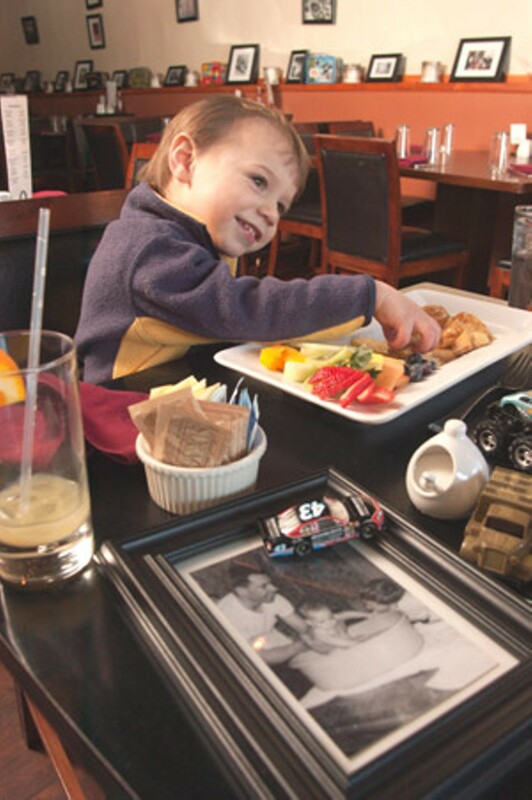 Family-friendly amenities: High-chairs and booster seats; kids'entrees for lunch and dinner, including grilled cheese, flatbread, mac and cheese and burger; no changing tables in the rest rooms; proximity to scenic Winooski Riverwalk, where you can walk off your meal. Our bill for four: $53, including tip.